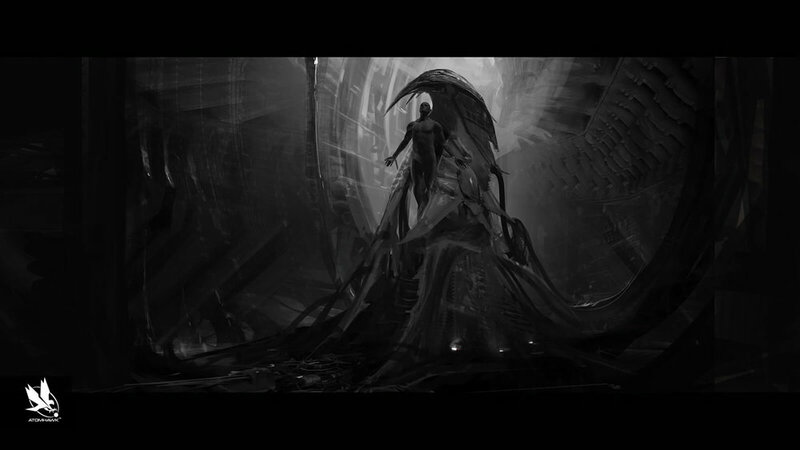 Marvel's film, Thor: The Dark World™, features key scenes, locations and spacecraft developed by the Atomhawk concept team. As well as creating concepts for the awesome Dark Elf and the Asguardian spacecraft, we also designed many of the key action frames, including the epic moment when the Dark Elf ship crashes into Odin's throne room. ”The challenge with the Ark was trying to come up with a design that was unique. There's been a lot of great spaceships created in the last twenty, thirty, forty years of film making. It's quite a trick to come up with something that hasn't been seen before. So there were many, many, many concepts done of different types of vehicles before we got to the final design." "A substantial amount of work went into the design of this craft. We were given Viking longboats as a reference, but needed to make it fly. The world of Thor blends myth, magic and sci-fi together, so we didn't want to just make a magical flying boat. We wanted its design to suggest it uses human technology of some kind to fly, but that technology is unlike human tech. It has typical Asgardian elegance." "The skiff is a day-to-day Asgardian vehicle - a little like a taxi, I suppose. So we had to get the right balance of day to day wear and tear vs. impressive Asgardian scale and attention to detail." "The Harrow ships are the fighter craft. Unlike the monolithic mother ship, they are fast and agile. We had the idea that they hang from the underside of the mother ship like stalactites. Once initiated into action, they detach and free fall like a rock. But when their dark-matter engines fire up, they are able to tear off at terrific speed." "We themed the Harrow ships on a number of things - bird wings and also ancient sword blades - taking our cue from the design of the mother ship."